When I was planning our Disney trip, I read every blog post I could find about visiting the park (both normal lifestyle/family blogs, and the dedicated Disney blogs as well). I wanted to know everything - How many rides could we get in before our Fast Passes started? How long would it take to travel from our hotel to Epcot? What were the best restaurants? 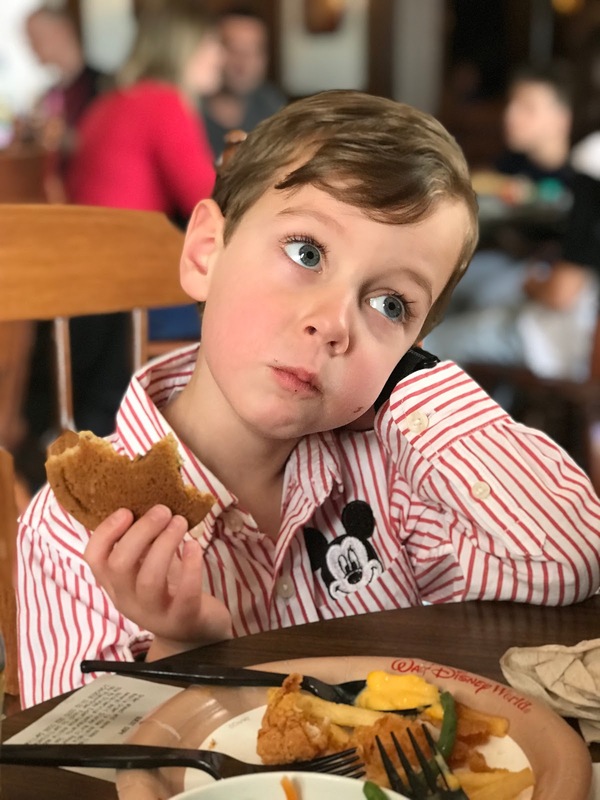 So, while it's fun to recap our days at Walt Disney world for our own sake, I also want to share our experience and what we learned for anyone out there planning a trip of their own. 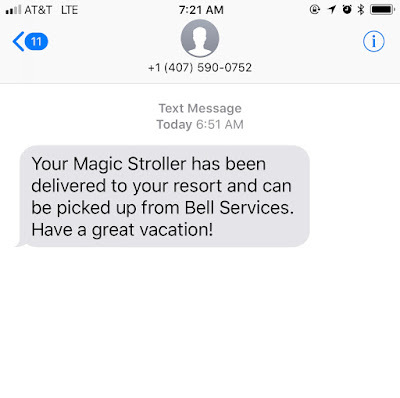 We woke up on our first day to this message from Magic Strollers, saying that our City Mini we rented for the week was waiting for us at Bell Services! It just couldn't have been easier. We picked it up around 8:30AM and started on our way to Magic Kingdom. For us, one of the best decisions we made was to be at the parks for rope-drop every day. Each park actually opens for entrance about a half hour before the actual opening. You can go through security and enter the park all the way up to the point where it's roped off. The Magic Kingdom even has a live show in front of Cinderella's castle during this time, and shoots off fireworks when the park officially opens. I shared this tip with one of my Junior League friends who was going to the park the week after us. "No problem;" she said, "we're morning people." Well, we are not. All three of us love our sleep and can be slow going in the mornings, plus WDW is on Eastern time, so a full hour ahead of us. Staying at The Contemporary, however, made it super easy to get to The Magic Kingdom before the rope drop. 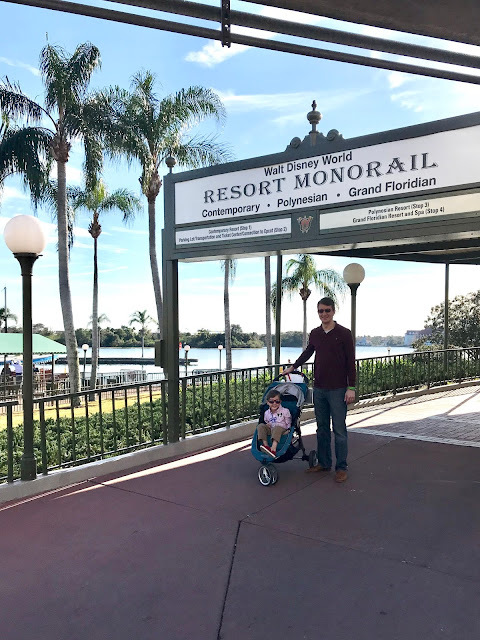 It's the very closest hotel to The Magic Kingdom, and even has a dedicated walkway there (which can be done in less than ten minutes). At the halfway point, there is a small security checkpoint that made staying at The Contemporary every bit worth it! 8:50AM We walked up Main Street and made it to the castle just in time for the 9:00AM rope drop. There are tons of Disney photographers lining Main Street for photos, and basically no lines for them this early in the morning, so this is definitely the time to get a picture in! You can purchase the Memory Maker package that gives you every single photo you take over the course of your trip, but we instead just selected a few to buy once our vacation was over (including the one below!). 9:00AM Parker looks just a bit apprehensive- he had no idea what fun was in store for him. While a lot of people arrive before rope drop, it's still the quietest time at the park and the best time to get on rides since they're all starting with lines of zero (we scheduled all of our Fast Passes to start later in the morning around 11AM). Parker's request for our first ride was the popular Buzz Lightyear's Space Ranger Spin in Tomorrowland. We had actually shown him You Tube clips of some of the rides to give him an idea of what to expect (especially with the rollercoasters) and he totally latched on to the Buzz Lightyear ride. TOMS - best shoes for Disney! The Buzz Lightyear ride was actually like an interactive arcade game where you could spin you car all around and shoot at targets for points - brilliant! Parker and I rode together with Max behind us. We got in and out super quickly, and by 9:15AM we were on our way to the next ride... Tomorrowland Speedway! Max and Parker rode together for this one. 9:45AM After that, we rode the moving walkway up to the People Mover attraction. Max remembered this lesser-known slow ride from years ago. We hopped on and it gave us a narrated tour all around Tomorrowland, including inside Buzz Lightyear and Space Mountain. 10:10AM The Monsters Inc. Laugh Floor opened at 10AM so we headed there next. This was maybe what Parker was most looking forward to as he had been a big Monsters Inc. fan well before we ever planned going to Disney. The Laugh Floor was a ten minute, interactive (projected) comedy show that had us all laughing (and had Parker bursting with joy about seeing Mike Wazowski). 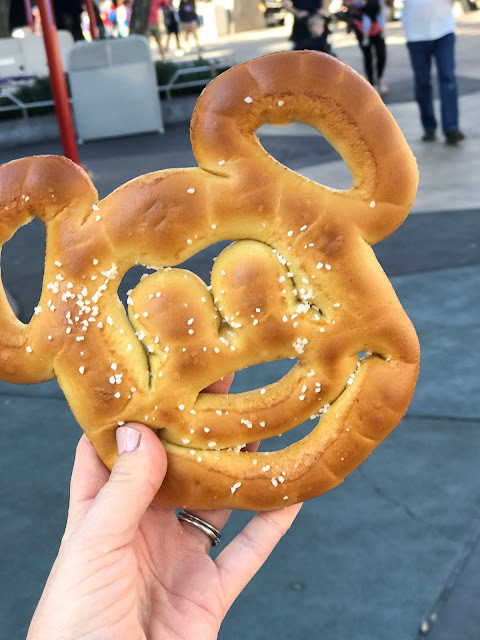 10:30AM We stopped for a snack in Tomorrowland - Mickey pretzels for the win! From there, we walked over to Fantasyland. 11:00AM I vividly remember riding Dumbo The Flying Elephant from my childhood, so I was super stoked to take Parker on it! 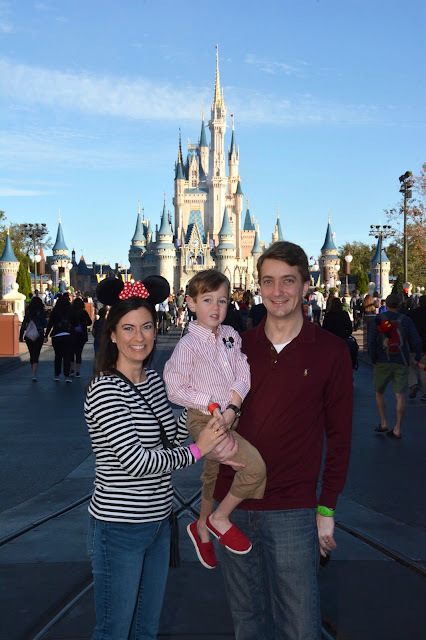 It gave such pretty views of Cinderella's castle from the air, and Parker loved making our car go high! 11:30AM Right next to Dumbo was The Barnstormer, the kids rollercoaster in Fantasyland. Our first Fast Pass (Meet and Greet with Mickey) was set to begin at 11:10AM, but they are good for one hour, so we got this one last ride in beforehand. We thought this mini rollercoaster would be a good introduction to the bigger ones we'd do later. Parker looked a bit freaked out before boarding, but he manned up and totally enjoyed it once we were on! And while it's labeled a "kids" coaster, I was totally screaming while riding - it was legit. 12:00PM Our first Fast Pass was a Meet with Mickey Mouse at Town Square Theatre, right at the front of the park, so we hightailed it there next to make our 11:10AM-12:10PM slot. 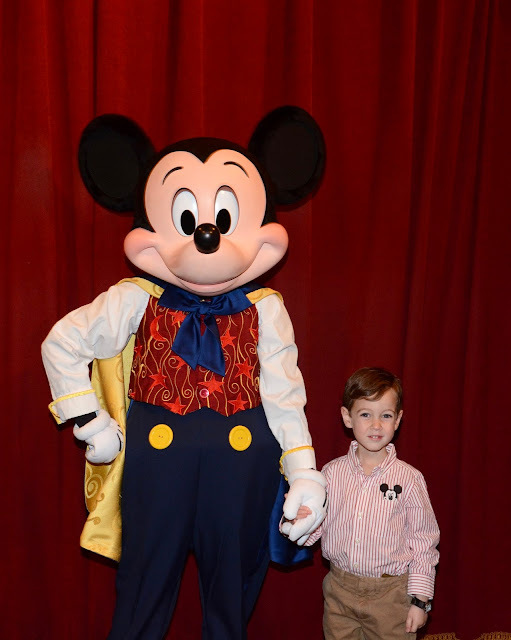 This is the only place in Disney World where Mickey talks at a visit! 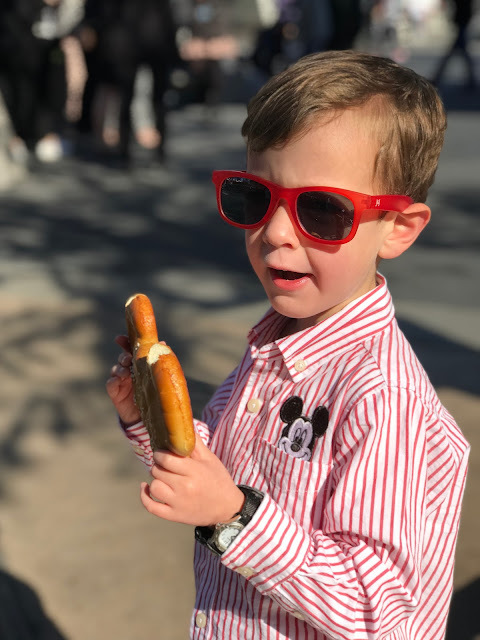 12:30PM We picked up Mickey Ears at the Town Theatre shop for Parker and had them embroidered with his name (this was purely for Mama, because Parker wanted nothing to do with his ears, haha!). I so adore mine, though! 12:45PM Our Fast Pass for Big Thunder Mountain Railroad started at 12:30PM, so we headed there next with the intention of lunching afterward (we figured riding on empty stomachs would be best, and it was only 11:30AM Alabama time anyway). Big Thunder is one of the big and fast coasters at Disney - and judging by the smiles I caught after we got off, these Princes (Charming) loved it. Someone was already looking a bit tired! 2:15PM We did quite a bit of stroller parking over our three days. 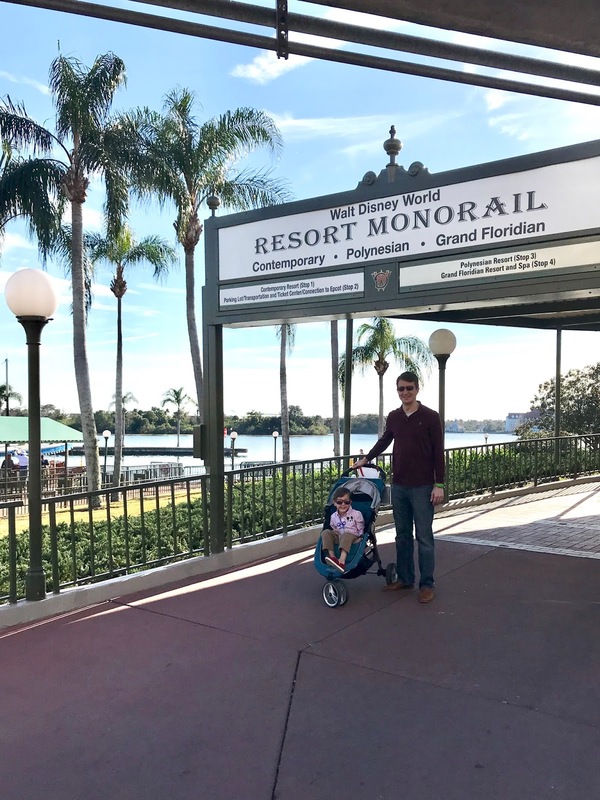 You'll want to leave your stroller to ride attractions and dine (we even left ours behind on day two when we boarded the train and just came and got it later). 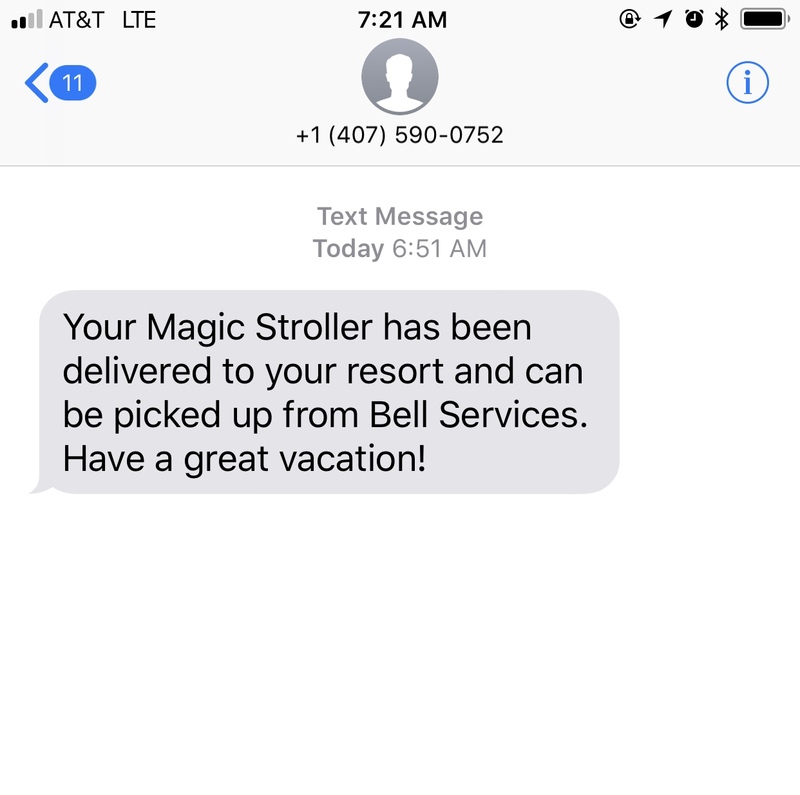 We never left valuables in the stroller (though valuables were minimal since our magic bands were linked to our credit card and dining plan - we didn't even bring wallets to the park). And while you might feel like you're leaving it a lot, it's getting a ton of use as well. On our first day, my Apple watch clocked 8.32 miles for us (and there was no way our four-year-old could have kept up with that distance without being pushed in the stroller!). What helped tremendously in locating our stroller each time we came to collect it was that cute little sign I wrote about in my planning post. Lots of the strollers look the same, so something bright with our name really helped us out (especially on those occasions when security consolidated and moved our stroller!). 2:30PM Our Fast Pass for Peter Pan's Flight started at 2:30PM, and we were there right on the dot. I had never been on this ride at Disneyland, but it was listed as a must-do fast pass because the line for it is always crazy (usually over an hour). It was especially meaningful for all of us since the ride takes passengers on a flight over London - where we visited in December! 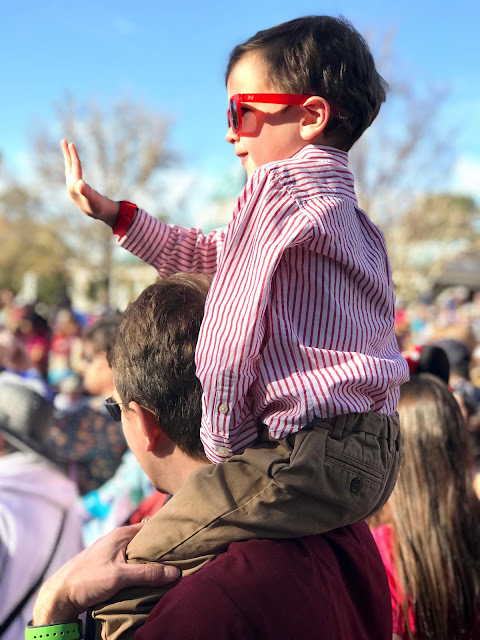 3:00PM The Festival of Fantasy Parade started at three, and while we didn't camp out for a half hour beforehand to stake out the front row, I think our last-minute viewing spot still worked quite well since Parker could watch from Max's shoulders. The parade was lovely and featured tons of Disney's traditional characters (I especially enjoyed the couples float with all the princes and princesses!). 3:30PM Dole Whip was on my mind after that, so I popped in line at Aloha Isle to get one (while Max picked up a frosted lemonade for Parker). As I was eating it, I seriously said (over and over) that it was all I wanted to eat, breakfast, lunch, and dinner. Our "Disney Dining Plan" gave us all one quick-service meal, one table service meal, and two snacks per night stayed on property (and the Dole Whip was by far my favorite snack item!). 3:50PM We headed back to the hotel for nap time! Instead of doing the ten minute walk back to The Contemporary, we hopped on the Monorail, which was totally empty (The Contemporary is the first stop when leaving The Magic Kingdom). I had read that late afternoon was the busiest time at The Magic Kingdom, so we used it to escape for a bit. We were seriously all ready for a nap, in bed by 4:30PM, and still fast asleep when our 6:45PM alarm went off. Luckily, this day was an "Extra Magic Hours" day, and the park would be open two bonus hours later for all resort guests (so, it would close at 10PM instead of 8PM). The nap was key in Parker making it through our late night - had he not napped, I think he would have been a disaster at dinner later! At home, he has rest time and sleeps occasionally during it, but since our days were so jam packed at Disney, he really needed the sleep. 7:25PM After our naps, we walked back to the park around seven, and checked in for our 7:25PM reservation at Cinderella's Royal Table (one of the character meals) right on time. 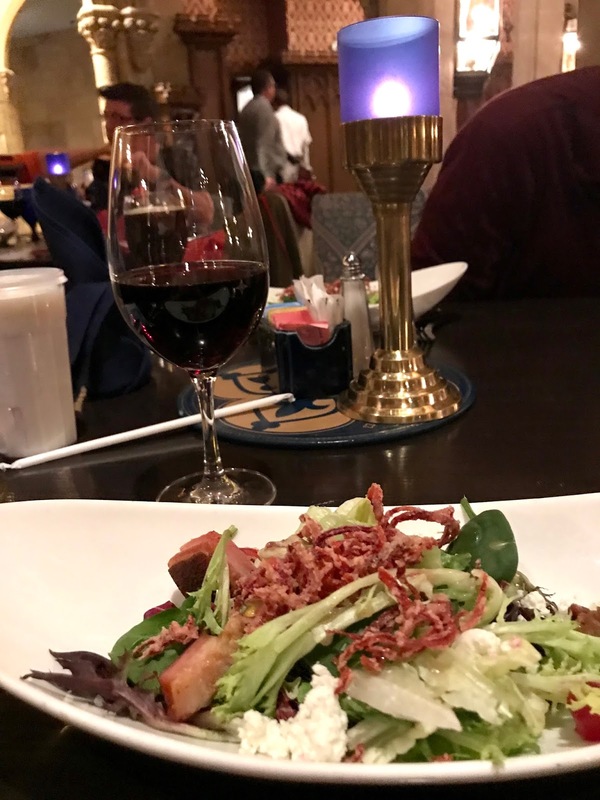 It's worth noting that at most all the Table Service restaurants, there was still a significant wait after checking in, even with a reservation (just a good thing of which to be aware when making your plans). 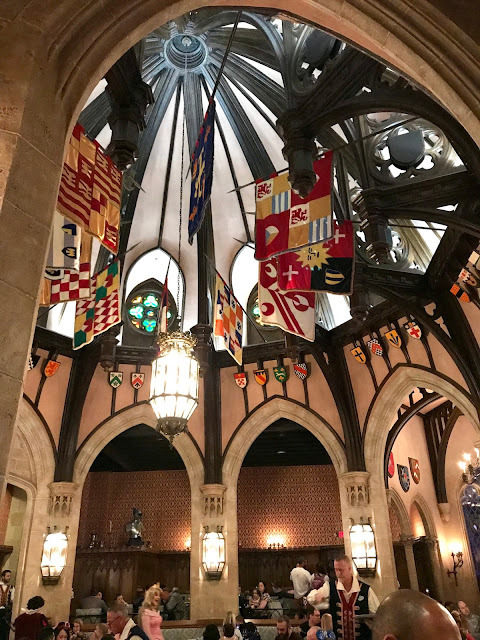 The wait time here included meeting Cinderella herself in the castle's drawing room, though, and Parker was simply in awe! 7:50PM Our "invitation" from Cinderella was called, and we headed up to the dining room! It was spectacular! Our dinner reservation was during the nightly fireworks show. We actually had to walk through throngs of people waiting for the show on our way to the castle, and entered via a separate roped-off back way since the area around the castle had been blocked-off for the fireworks. 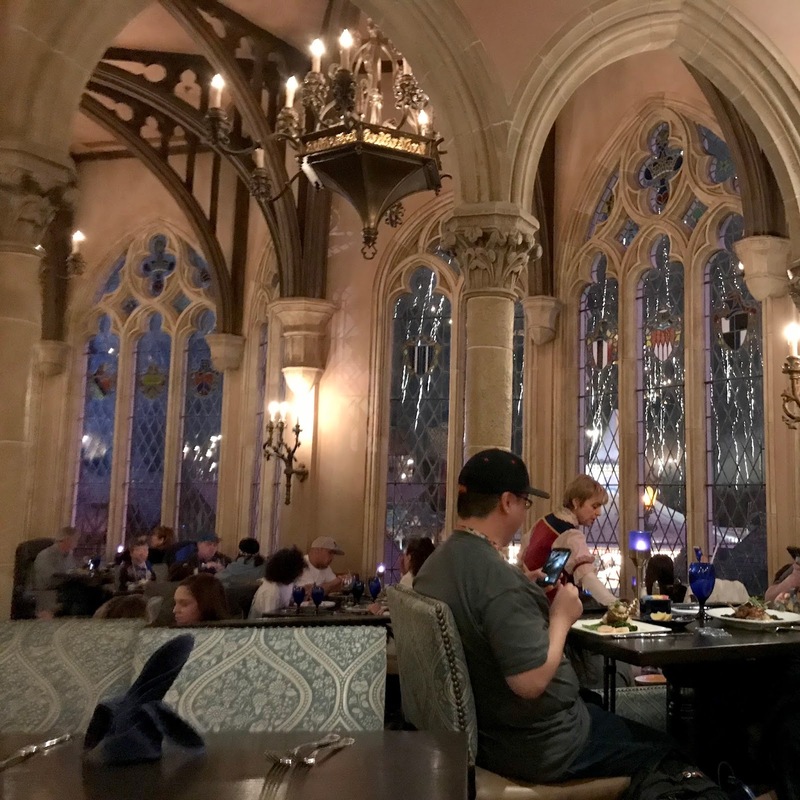 I had read conflicting accounts of how much we'd be able to see out the windows, but I was pleasantly surprised when the restaurant dimmed the lights and piped in the fireworks music soundtrack to go along with what we could see out the windows. The view is definitely obstructed as compared to what you'd see outside, but it was a really unique way to experience them nonetheless! It also made dinner all the more special. Parker kept repeating over and over that it was the most magical place on earth. Cinderella's Royal Table actually requires two Table Service Credits per person (and it indeed worked out to be worth double a regular table service bill, clocking in at what would have been a $200 meal for the three of us had we been paying cash 😳). Included in our table service credit per adult was an appetizer, entrée, dessert and alcoholic beverage (I ordered a glass of my beloved Meomi Pinot Noir). Once again, I was impressed with the kids meal selections. Parker ordered a filet that came with corn and mashed potatoes (he loves his steaks! ), and was sent out cheese and grapes for his appetizer. Max did a filet for his entrée as well, and I went with the braised pork shank. But best of all were the visits from the princesses while we were dining! They all took the time to chat with our little man. Parker (very worried) asked Princess Aurora if Maleficent would be coming, and she assured him that Maleficent was not invited to Cinderella's castle. Princess Jasmine gave him a real kiss on the cheek - complete with a lipstick print! It was a super special experience to dine in the castle. It's such an iconic Disney landmark, and now whenever Parker sees it with the Disney logo (like in the intro to a Disney movie) he'll exclaim that we had dinner there. 9:00PM Dessert arrived! This chocolate mousse was my favorite dessert of the whole trip (plus, how adorable is the clock showing midnight?). Parker lucked out with a decorate-your-own cupcake platter. 9:30PM We hit up one last ride before calling it a night (again, it was only 8:30PM to us, so we were all doing fine). I had really wanted to introduce my boys to Pirates of the Caribbean (Max had never been!). They both thought it was super fun and Parker became obsessed with the song A Pirate's Life for Me. We left the park just as it was closing at 10PM (to sweet Disney music) and, after viewing the lines for the monorail, opted to just walk back to the hotel so we could rest up for the next day of fun! 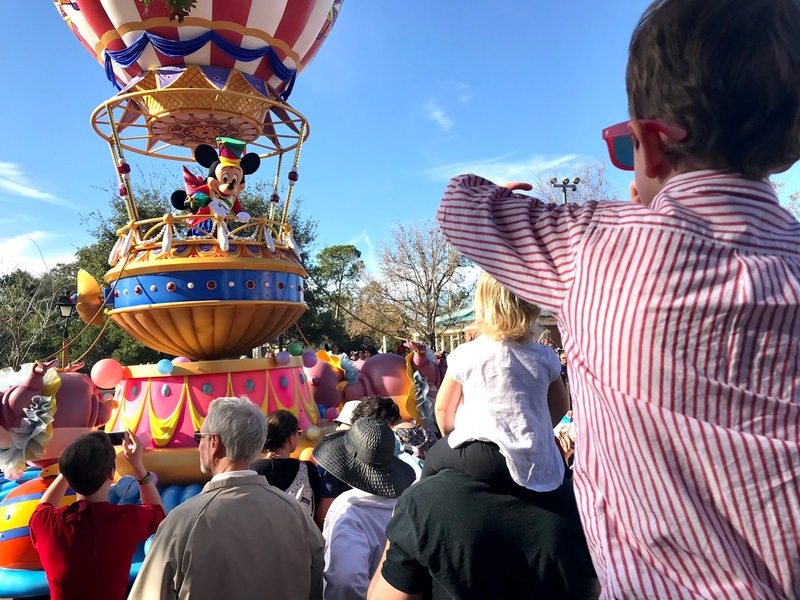 In total, nine attractions, one meet and greet, two snack stops, one parade, one quick-service meal, one table service character meal, naps for all of us, one monorail ride, and eight miles covered on foot. I'd say we did pretty well for our first day at Disney! If you missed it, read all about our Disney World prep and our travel day HERE. Girl you have me SO excited for our trip! OBSESSED with your trip recaps! You have me totally inspired to do better with our's because you are right, I savor posts like these if I'm planning trips or not. I got teary so many times during this post. 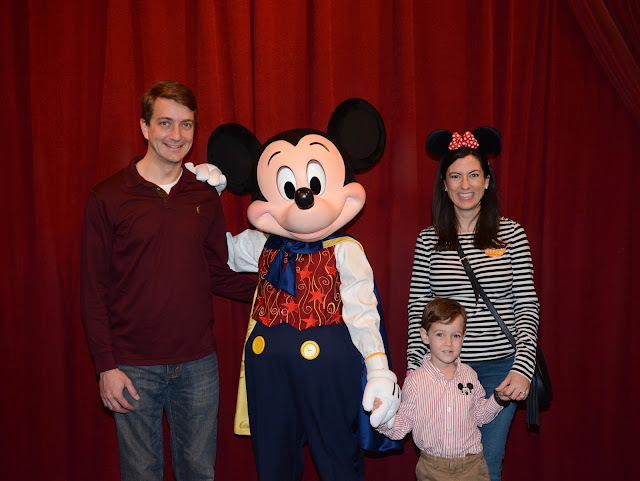 Such a magical experience and great memories for your family!! You are so sweet!! Magical is the only way to describe it!! And thank you!